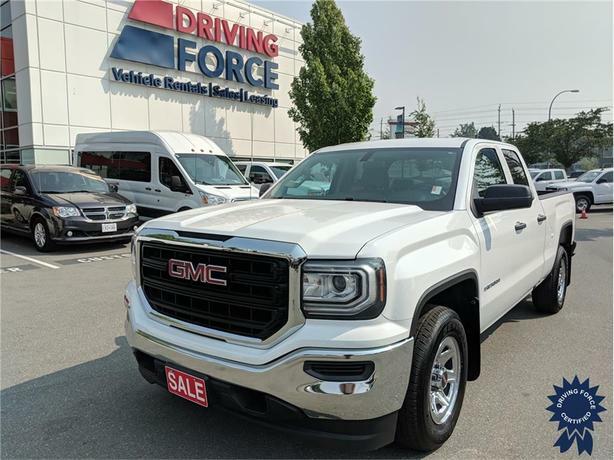 This 2016 GMC Sierra Double Cab 6 Passenger 2WD truck comes with a 143.5-inch wheelbase, 6.5-foot cargo box, 17-inch wheels, 6-speed automatic electronically controlled transmission, 3.42 rear axle ratio, cloth seat trim (dark ash seats with jet black interior accents), 4.2-inch diagonal color display, AM/FM stereo, Sierra Appearance Package, Sierra Convenience Package, engine block heater, heavy-duty locking rear differential, trailering equipment, outside heated power-adjustable mirrors, deep-tinted glass, cargo box LED lighting, remote locking tailgate, remote keyless entry, one 110V AC power outlet, rear vision camera, 150-amp alternator, rear wheel drive, and GVWR rating of 7,000 lbs (3,175 kgs). The 5.3-litre EcoTec3 V8 gas engine provides 355 horsepower at 5600 RPM and 383 lb-ft of torque at 4100 RPM. Message us for more information about this DRIVING FORCE Certified vehicle.